Finding a good single serve coffee maker is essential for daily coffee drinkers. Whether you live alone, want the flexibility of single-servings, or you’re just the only coffee lover in your household, it’s important to find a coffee maker that suits your needs without forcing you to make more than you need. Personal coffee makers come in a huge range of shapes, sizes, and forms – from electronic coffee machines that sit as a permanent fixture on your kitchen worktop, through to handheld devices you can take to the office or even travelling. Take a look at our reviews below to find the perfect coffee maker for you and your lifestyle. We have reviewed the top 10 single serve coffee makers available this year – this includes espresso makers and filter coffee makers, as well as devices that can make more than one type of coffee. Take a look at the options below to find the perfect coffee maker for your home, desk, or travels. If you’re not sure what you’re looking for, read our Single Serve Coffee Maker Buyer’s Guide at the bottom of these reviews – it will help you narrow down your options and make sure that you’re buying the right coffee maker for you. 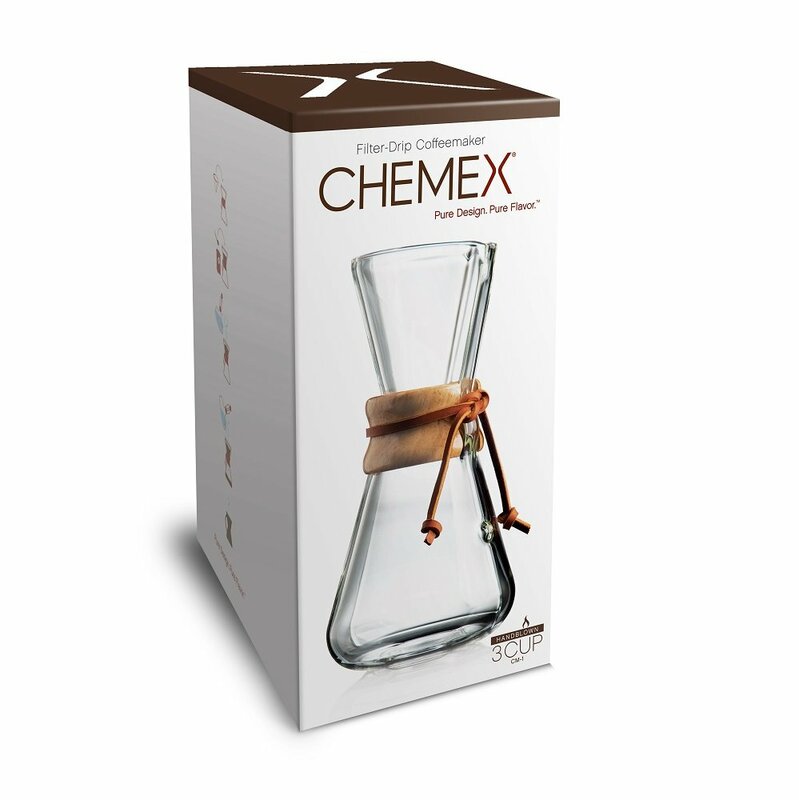 The Chemex was invented by a chemist in the 1940s to create the best possible cup of coffee – it’s incredibly simple, with a classic hourglass design, no electricity needed, and only uses materials that impart no additional flavors. It takes a few minutes to brew, but it makes outstanding coffee with no fines, great taste, and no metallic flavors that you might get from a French press or other methods. First things first, the Chemex looks great. It has an old-time look and feel with hourglass curves – the handblown range is really beautiful and will look great on your worktop or shelves. Of course, glass comes with some drawbacks, such as fragility. 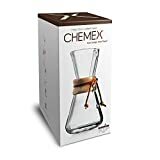 It’s likely you’ll be moving your Chemex around before and after use so you do need to be slightly more careful than with other items in this list. It’s not truly portable, in that you can’t throw it in a bag to take to work with you but it’s definitely not as cumbersome (or ridiculous) as taking your coffee machine from place to place on a regular basis. You will need other coffee gadgets if you’re using a Chemex – namely, a good coffee grinder, a scale if you’d like to get the coffee:water ratios just right, and a good kettle with a gooseneck for better pouring. You’ll also need to replace the filters as you use them, and will need to buy Chemex bonded filters to make sure that they don’t fall apart. It’s great for people who want a lo-tech solution to their coffee and don’t mind taking the time to figure out the best way to get their coffee maker to work. It does take more fine-tuning than some other methods, but many, many coffee lovers have chosen the Chemex and not turned back. However, if you want a fairly hands-off method or you want an all-in-one where you don’t need additional bits and pieces to get your morning cup of coffee, this is not the solution for you. From vintage coffee makers to the new kid on the block – the Trinity ONE was funded through kickstarter and smashed its goal of $60k. 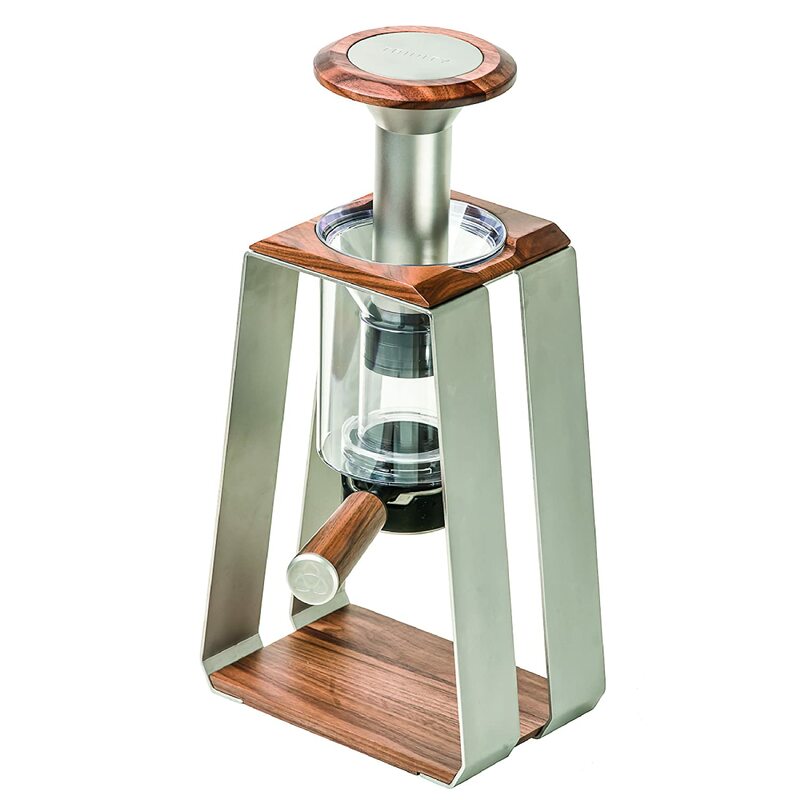 The design is a blend of tactile materials like walnut timber, with modern simplicity – there is a press cylinder, end cap, brew chamber and stand, and a filter head (which is optional). You have the option to choose between press, drip, and immersion methods to satisfy whatever your craving is that day – it’s been described as the swiss army knife of coffee makers, which is pretty accurate. It’s an incredibly simple mechanism and it’s definitely one of those gadgets that you look at and wonder how we got to 2017 without creating one before. It’s not especially portable, but like the Chemex it’s easier to move around than a standard coffee maker since you don’t need an electrical outlet for it. Like the Chemex too, you will need to buy additional items (such as a grinder) and will need to take some time learning how to make the most of the ONE. It’s definitely time well-spent given the quality of the coffee, consistency (thanks to the cylinder which moves on its own), and the sheer beauty of the thing. If you want a single piece of kit for your coffee, or you don’t want to spend time fine-tuning your methods,this isn’t the right coffee maker for you. If you love good design and don’t have a single favorite type of coffee, this is a great choice. You get a lot for your money both in terms of build quality and in terms of options. It’s classic, beautiful, and offers a great variety of coffee types without having to buy and find room for 3 different makers. If you want simplicity in input rather than design, Nespresso is a great choice. You use coffee capsules rather than having to grind coffee yourself or even pour in beans. 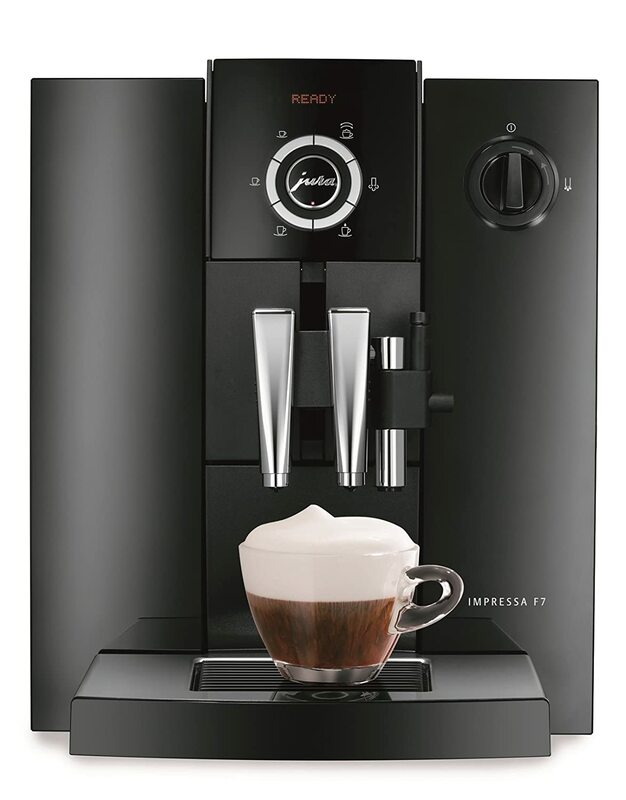 It offers one-touch brewing so you get your coffee or expresso with the minimum of fuss and the capsules even come in single-cup sizes so it truly is a single serve coffee maker. The VertuoLine has been designed to make your coffee easy – the machine reads the bar code on each and every capsule to know how to treat it. Espresso capsules are spun while injecting 19 bars of pressure for rich crema and excellent flavor. The capsules themselves are made to retain the freshness of your coffee, and the individual units mean that you don’t need to worry about grinding your coffee and not using all of it. Capsule coffee makers have received criticism from people who see it as wasteful or uneco-friendly. 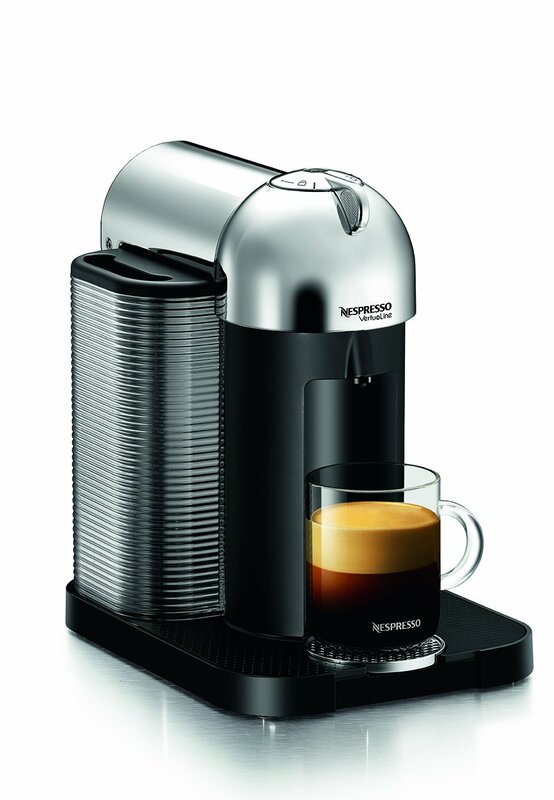 Nespresso do offer a recycling service for the capsules so you can reduce your environmental impact. That said, it depends on your own personal views and attitudes – for some, there is still too much packaging used, while others might like to use their coffee grounds for composting or in the garden. Eco-credentials aside, this machine makes excellent coffee. If you want to adjust each aspect of your drink or buy coffee from various sources, this coffee maker may not be for you. But if you just want a fuss-free coffee with minimal input and excellent taste, the Nespresso should definitely be a contender. 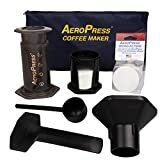 Given how little the Aerobie Aeropress costs and the fact that it’s made entirely from plastics, you may be surprised just how many coffee lovers have embraced it as their default way of making coffee. That’s because the coffee quality is genuinely excellent and you have the added bonus of being able to throw it in a bag to take to work, your boyfriend’s/girlfriend’s house (without looking too weird), or even camping or on holiday. This is probably the most utilitarian coffee maker on this list – it doesn’t look pretty and the form is entirely about function and nothing else. But if you’re a coffee lover, at least try it once. Given the price, there really aren’t many reasons not to. Like with some other coffee makers on this list, you will need to buy a grinder and use a kettle. This, however, is one of the few true single serve coffee makers in that it really does just make one cup at a time. It’s essentially a giant coffee syringe that you can use to make espresso-type coffee (not necessarily true espresso which needs closer to 9 bars than the 2-3 you get from the AeroPress) or drip-brewed coffee. It’s easy to clean but whether or not it’s easy to use does depend a little on your upper body strength. You do need to press the plunger down, and if you don’t have a good grip or you’ve skipped the gym, it may take a bit more effort than you want first thing in the morning. Now onto the plastic – it is made from 3 different plastic types and is BPA-free. It’s not a very attractive material, and to be honest it’s not a very attractive coffee maker, but glass would not be anywhere near as portable and metal has it’s own taste issues for some people. Plastic is easy to make, easy to travel with, and easy to clean. The resulting coffee is as good as what you get out of a most coffee machines – you can control the strength, and it’s definitely flavorsome. If you love coffee, give the Aeropress a chance. It’s not a big investment but it can improve the quality of your coffee at home, in the office, and on the road. Very free coffee makers can offer so much and require so little. If you’re looking for a good shot of espresso while you’re on the go, the MiniPresso is an excellent choice. 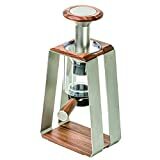 It is specifically made to offer espresso and produces around 8 bar pressure so definitely has the potential to make a true espresso – even at the top of a mountain. 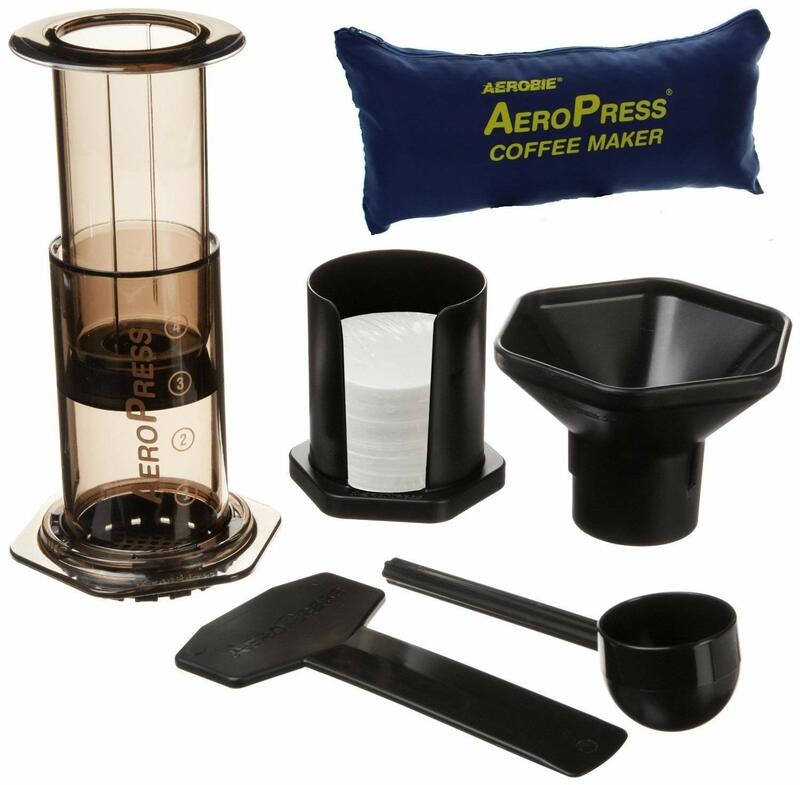 It has a mini coffee scoop, water chamber, and coffee basket, and lets you apply pressure manually. The design looks like a small thermos and generally looks like something you could comfortably toss into a bag. 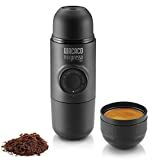 It closes up well even after use so you don’t need to worry about dripping coffee or getting grounds on your things, which is one of the major benefits of this design when it comes to coffee on the go – you don’t need to clean it before you move on. The flavor isn’t quite what you’d get from a quality, standard espresso machine, but considering the price and size of this machine, it’s very close. 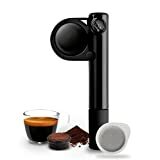 It’s a great choice for anybody who wants good espresso while travelling or even has a small kitchen without enough room for a full espresso machine. The design is intended for travel, and the all in one package means you won’t need to bring anything else with you if you just want a shot of espresso wherever you are. It’s great for tiny kitchens or people on the move, but if you have the room for a larger coffee maker or you specifically want fantastic espresso without as many worries about price or size, there are other options for you. When it comes to portability, the main contender for the MiniPresso is the Handpresso Wild Hybrid – it isn’t quite as streamlined, but does have slightly better build quality and only has 3 parts so there’s less to keep track of. It is slightly larger, so many not be suitable for trips where you have very restricted space, but it does offer higher pressure and slightly better coffee. The pumping mechanism means that it can produce up to 16 bar pressure, more than enough to make a true espresso wherever you are. The build quality comes at a higher price, but you can see how much pressure you’ve built and the consensus here is that the Handpresso offers better tasting coffee than the MiniPresso. The choice between the two largely comes down to size, budget, and of course personal preference. While the materials on the Handpresso are thicker, the design isn’t quite as streamlined or convenient as other handheld coffee makers in this list. If you’re a stickler for true espresso and want something that you can put in a drawer or take with you on a camping trip, this is an excellent choice. 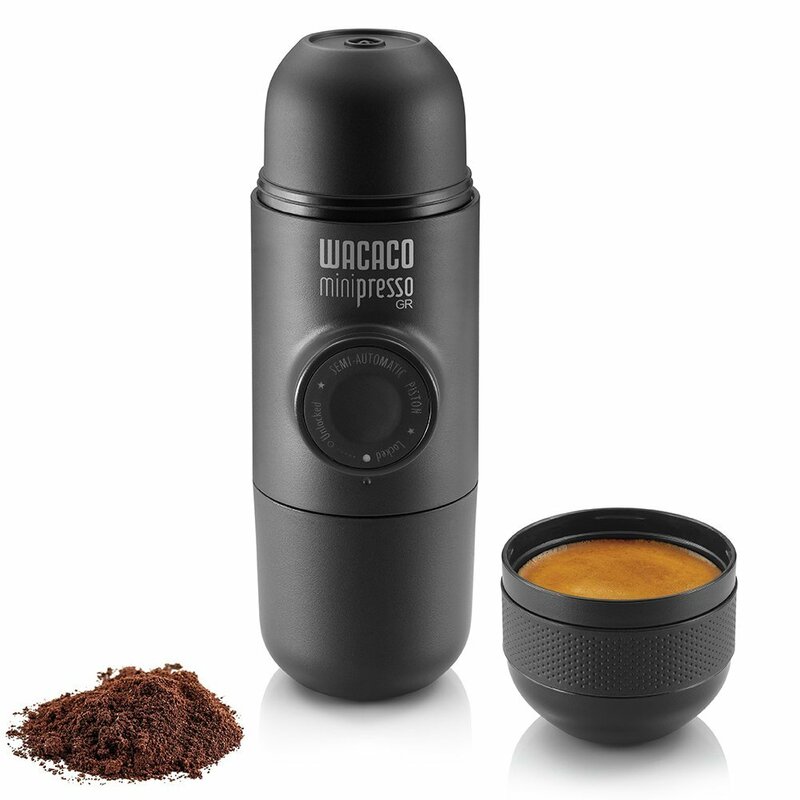 If you have extremely little space and need to pack more efficiencly, the MiniPresso is probably the better bet when it comes to handheld espresso makers. If you do have kitchen space for a machine or less portable maker, it’s typically best to buy one since there are more options available and the design has been based more around producing the best coffee in the most convenient way, rather than having to consider packing and durability. 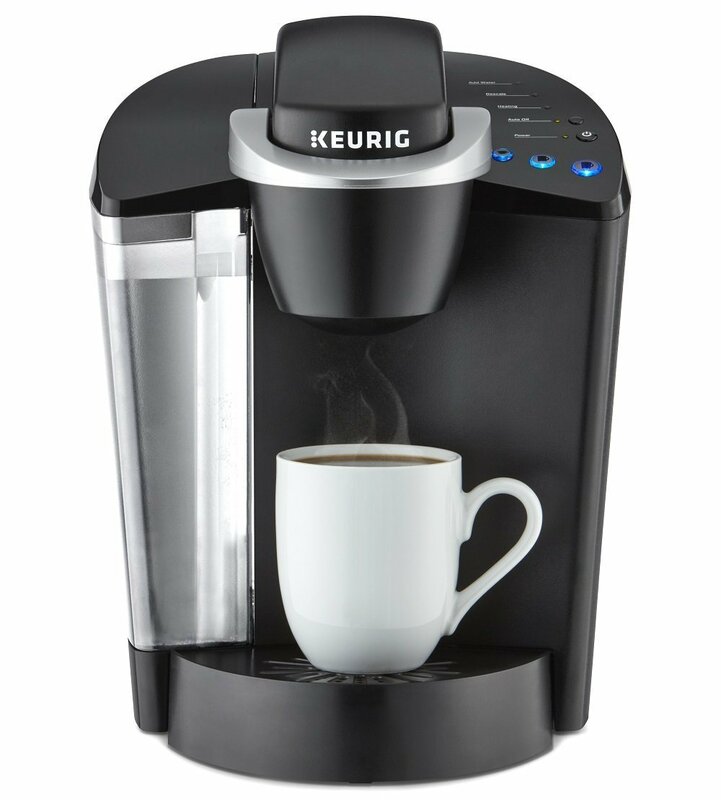 Keurigs are the most popular type of pod coffee maker – they’re convenient, easy to use, and generally offer good coffee the minimal fuss. 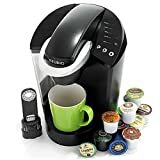 If you’d like a simple, single serve coffee machine the Keurig has got it down to a fine science and does not require you to know your grinds, understand the physics of espresso, or generally spend time fine-tuning your requirements. Previously, Keurigs did get some criticism from coffee lovers for only being able to use the K-cups – now you can use ground coffee as thanks to the My K-Cup Reusable Coffee Filter. This opens up your options if you’d like to buy coffee from your local roaster or via a subscription, rather than having to buy specific K-Cups. However, K-cups are quite difficult to recycle. While there are options available, like Recycle a Cup, you’ll need to cut and separate the cups into plastic, aluminum, and coffee grounds. You can use the coffee grounds if you separate the cup into its constituent parts, and then recycle each part separately, but it’s definitely not as easy as recycling Nespresso pods or simply putting your coffee grounds in the compost. This is an excellent machine if you want ease of use and good coffee without the effort or in-depth knowledge. There’s a good reason why Keurigs and pod coffee makers are some of the most popular coffee machines in the US. If you tend to drink your coffee on the go, it can be difficult finding a coffee maker that will work with a tall travel mug. That’s precisely what the Hamilton Beach Coffee Maker has been designed for. It’s a simple, compact machine that doesn’t necessarily have the bells and whistles other machines do, but it will produce decent coffee if you make a few tweaks to your process. One of the main complaints about the Hamilton Beach is that it makes weak coffee, but you can easily improve the flavor you get out of it by tamping your grounds properly. You can also improve the coffee your machine makes by soaking your grounds briefly before you brew to get the most taste out of them. Once you have found work-arounds to the main flaws, this is actually a very useful and intelligently-designed machine. You can easily take it apart, clean it, and it will last a while. It’s also considerably cheaper per cup than Keurig or Nespresso, so you will be saving money both when you buy the machine and while using it. It has an attractive design but it still has a small footprint in your kitchen. The biggest issue with is the risk of brewing weak coffee or having a plasticy flavor, but you can overcome this by running the machine a few times and making sure that you follow some basic processes to get the most out of your grounds. It’s not as easy to use as Keurig when it comes to consistency, but you can still use it to make a good cup of coffee. It’s probably not a machine for purists or very serious coffee lovers, since the actual results may not live up to high standards, but if you just like a decent cup of coffee in the morning and want to cut down on how much you spend at the local coffee shop, this is definitely a reasonable solution. If you’re looking for a pod coffee machine, the Inissia is an excellent choice. Nespresso have improved on previous designs and ensured that each generation is a little better than the last – if you have heard that Nespresso machines need time to warm up before you choose your coffee (for example), it’s no longer true of the Inissia. The machine is tied to Nespresso pods, so you do not have the option of grinding your own coffee or buying from your local coffee maker. 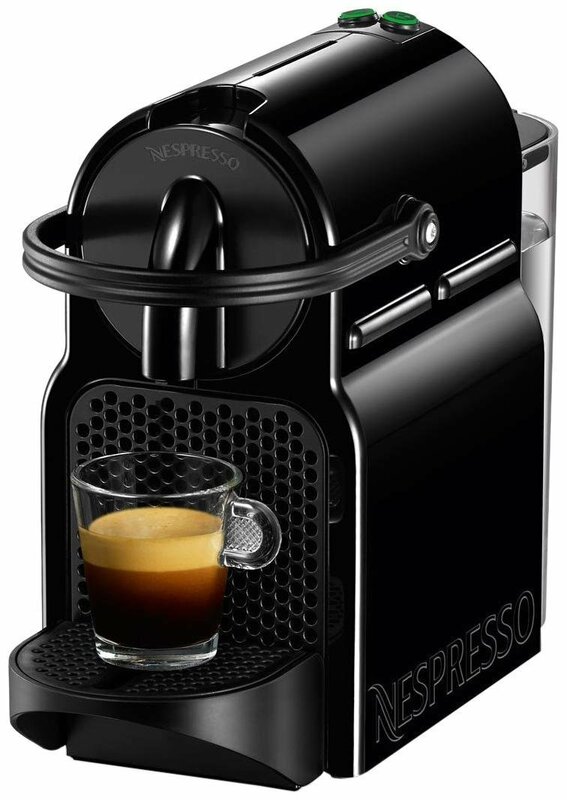 However, it does what it says on the tin – it produces espresso quickly, simply, and reliably. If you want to learn about the ins-and-outs of making espresso or you’re already a seasoned barista, there are certainly other espresso machines that are more suitable. However, if you’re an espresso lover who does not want to dedicate time and energy to ‘the craft’, not to mention sourcing the perfect beans or getting to know your grinder, the Inissia is an excellent choice. It’s a compact, economical machine that delivers the basics but does it well. If you don’t want to make any compromises when it comes to your coffee, the quality of your machine, or its longevity, the Jura Impressa is the answer. Granted, quality, consistency, and ease of use all comes with a price tag, but if you’re a serious coffee lover it’s definitely worth it. Firstly, it has an excellent cleaning system and you can just use a cleaning tablet when the machine prompts you to – no need to learn complicated cleaning procedures or take the machine apart. General operation is just as simple – there plenty of coffee options to find your favorite, including ristretto, espresso, and cappuccino (to name a few). The milk spout is adjustable so you can use a variety of different coffee cups, and it’s even energy efficient. The machine isn’t very compact but it’s not huge either. The system is very intuitive and you can prepare more than one cup at once if you’d like. It’s a full size and almost one-touch coffee machine, and while it’s the most expensive on this list it’s certainly cheaper than many others that offer the same quality and functionality. It comes with a burr grinder and you can program different drink options based on your tastes – perfect if you don’t want to buy multiple gadgets or spend time inputting your preferences every single day. As far as single serve machines go, this one is practically perfect if you don’t want a portable machine. The customization options do only remember one preference per drink, but for single serve coffee makers that’s generally more than enough. It delivers excellent coffee day after day, without needing you to commit to single coffee type or learn the ins and outs of coffee making. If you’re willing to spend the money on a quality machine, this is an excellent choice. If you live alone, you’re the only coffee-drinker in the house, or you just don’t have much room for your coffee maker, finding the right single serve coffee machine can brighten up your mornings and save you money too. With any purchasing decision, it’s important to know exactly what you want before buying so you don’t end up with a lot of unnecessary features or, worse, a machine that doesn’t match your own habits and day to day life. The products we chose for our reviews here are probably the most varied – you have everything from completely manual to super-automated machines, from coffee makers you can throw in your bag to machines that you install once and they remember your coffee preferences. If you’re a little overwhelmed by the choices, take a look at the list below to help you figure out exactly what you need. Do you want a portable coffee maker? Will you be taking your coffee maker with you on hikes, trips, or just to the office? This means you need something that’s easy to pack, durable, but still makes the type of coffee you want. Do you have a kettle? Some of the coffee makers on this list, such as the Chemex, need you to boil water separately from the machine. If you’d like to buy an electric or stovetop kettle that’s fine (or if you already have one), but if you want an all-in-one machine it’s important to buy one that has a water reservoir and can make your coffee without you having to make that additional input. Do you have a grinder? Likewise, if you don’t have a coffee grinder and you don’t want to buy one, you probably want to use a machine that has a built in grinder, like the Jura Impressa F7, or one that uses K-cups or coffee pods so that you don’t need to grind your coffee separately or buy ground coffee. It’s generally best to grind your own coffee if you choose that path, since fresh grounds offer much better flavor. Once of the benefits of capsules or K-cups is that they keep the grounds fresh for a little longer and you don’t need to worry about them getting stale after opening a pack since they’re all single-serve. What type of coffee do you want? 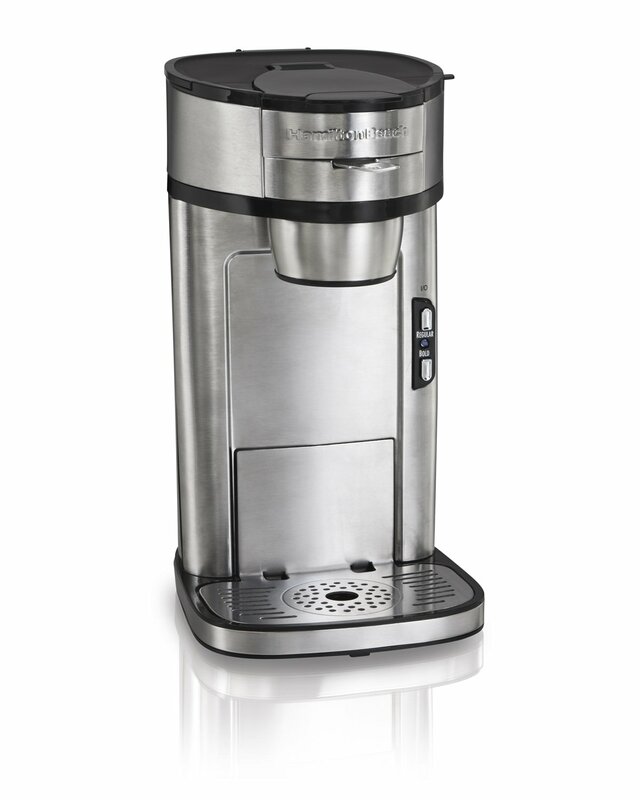 If you’re an espresso-lover, of course you need a coffee maker that can deliver that. If you like filter coffee or just want an Americano in the morning, make sure that your coffee maker offers the right functionality. How much input do you want? If you’re a would-be barista, it’s probably best that you check out our other espresso machine reviews, as they have much more manual options. However, there are some options in this list that give you greater control and input into your coffee outcomes. How important is beautiful design? Ultimately, a coffee maker is functional first, but there are some coffee makers like the Trinity One and even Chemex that are so beautifully designed that they’re almost sculptural. If design is important to you and you want to show off your coffee maker, make sure that you choose one that you’d want to proudly display in your kitchen. How much room do you have? This list offers a huge variety of sizes for every single kitchen and coffee lover. There are a few hand-held espresso and coffee makers that you can keep in a drawer or a bag until you need to use them. There are others that you can keep in a cabinet, others that are compact and won’t take up much room on your worktop, and others still that are made for more generous kitchens. A tiny kitchen doesn’t mean that you can’t have good coffee at home, it just means that you need to choose the right maker that fits your storage requirements. What’s your budget? Budget is usually one of the strictest constraints for coffee makers – this list features everything from $30 makers through to $1000+, so you’re bound to find something that fits your needs. Once you’ve answered these questions, you should have a better idea of what you’re looking for and we hope you’ll be able to make a more informed decision when choosing your coffee maker.